Warning: preg_match() [function.preg-match]: Compilation failed: disallowed Unicode code point (>= 0xd800 && <= 0xdfff) at offset 2112 in truncate_utf8() (line 339 of /home/content/50/13965250/html/includes/unicode.inc). Preserve your home video memories onto DVD and support worthy cause at the same time! 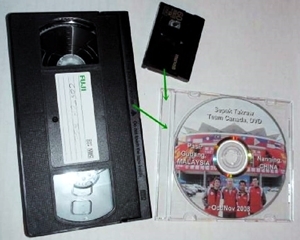 We transfer your VHS, 8mm, and/or MiniDV Video Tapes onto DVD Discs. You will be able to view and enjoy your 'Memories DVD' on any DVD player. Once on a DVD, with software, you can also select and edit footage from DVD with your computer. Price: $20.00 per DVD video transfer (DVDs hold up to 1 hour of video footage). Includes: background picture, title & contents description (customer supplies) on disc face. Includes: clear & frosty jewel box. Adidtional Copies: $7.50 for each additional identical DVD disc copy. Don't wait any longer, contact us today ... preserve all those memories before it's too late. All revenue raised by this service goes directly to support STAS programs and athletes! ... AND SPREAD THE WORD ABOUT THIS FUND-RAISER TO YOUR FRIENDS/RELATIVES! I brought in a shoebox of videos cassettes of our family in the 80's. Sepak Takraw Sask transferred them ALL to DVD for me, and I later gifted them to my parents. Sepak Takraw Sask was really friendly and very helpful, going over all my options and what was available and what could and couldn't be done. Turnaround time was quick, my DVD's were completed on time for a reasonable price. In the end I had professional quality DVD's that we spent hours watching over the holidays together. Thanks to Sepak Takraw Sask for rescuing these precious memories from that dusty old shoebox and bringing them back to life for us. We'll enjoy them for many years to come.